Delightfully dainty, this short homecoming party dress features a sheer-illusion bodice beautifully adorned with embroidered-lace appliques. 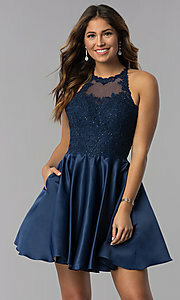 Adding just the right amount of sparkle, the intricate lace appliques are sprinkled with dazzling rhinestone embellishments and frame the high-scoop neckline on the semi-formal party dress. Thin spaghetti straps support the high-neck party dress and criss-cross over the alluring open back. A lustrous short satin skirt with tulle lining begins at the natural waistline and flares out away from the hips in dramatic fashion. Bringing a practical vibe to the stylish semi-formal dress, pockets provide a convenient place to keep your valuables at your side. 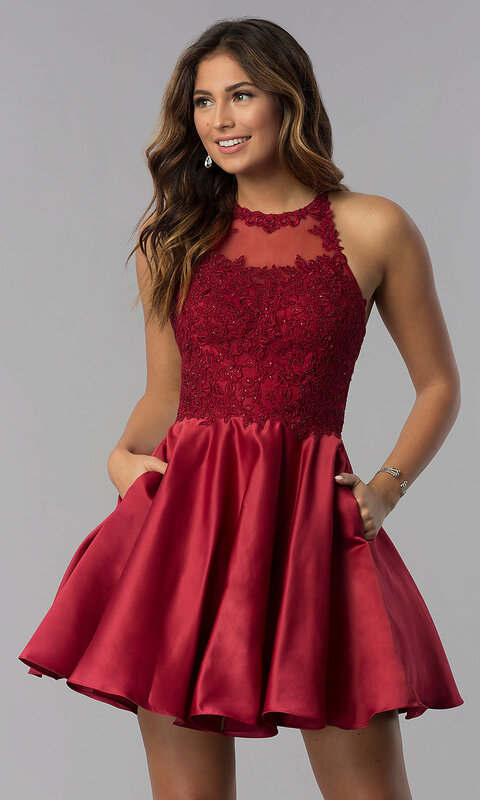 For a refined look at homecoming, a holiday party, or another semi-formal event, simply slip into this short homecoming dress with embroidered-lace appliques.